The Lake George Wild Forest offers unlimited opportunities for open forest bushwhacking. It's really doesn't even fell like bushwhacking since the forest canopy is generally very open. This morning I looked at my map to see what new peaks I could explore in the area. I settled on Elephant Mountain in the vicinity of Hulett's Landing. Leesa and Rev joined me for what turned out to be a really nice day. We drove north on Route 22 to County Route 6 and turned west towards Hulett's Landing. The mountain that will catch your eye as you drive west is Sugarloaf Mountain. I stopped to take a few pictures of it. There is a band of cliffs that surround the entire mountain. A large tract of land west of the mountain used to private property, but it has recently been acquired by the state. Was there a way up Sugarloaf? Next we took a left on Pike's Pond Road, and parked at the trailhead for Black Mountain. My thought was to hike in a half mile or so on the trail to Black Mountain, then bushwhack NE to Elephant Mountain. There is an old jeep road on the west side of Sugarloaf Mountain and we followed it as it would it's way around Sugarloaf. With many of the leaves now off the trees, we could see Sugarloaf Mountain on our right. It really has a presence. We decided to add it to our trip and veered eastward to look for a seam in the band of cliffs that guard the summit. We found one at the NW corner of the mountain. With a little care, we were able to scramble to the top. The view from the NW corner of the summit proved to the best, but as we circled the summit cone, we found other good views as well. We also got an up close look at a Barred Owl! The Barred Owl, looking straight at me! The only drawback we were having on this day is that we each picked up a half dozen ticks on our hiking pants during the day. The ticks seem to be most active in the spring, but they are also active in the fall, and they found us today. From Sugarloaf, we retraced our steps down, then continued on towards Elephant Mountain. We crossed several drainages and discovered 3 nice waterfalls. The summit of Elephant Mountain is very nice and is carpeted with pine needles from Ponderosa Pine, or something similar. Once again, the NW corner of the summit offered the best view of the lake. We ate our lunch on the summit of Elephant. The weather was still sunny, but the sun was beginning to alternate with some clouds. The clouds were on their way and would soon take over. From Elephant, I wanted to continue west to a small bump between Elephant and the lake. I wanted to see if the bump offered additional views. When we arrived, Leesa named the bump the "Elephant's Peanut". There were some filtered views, but by dropping a little lower to the west, we found views of both the Mother Bunch Islands and the islands of the Narrows. The clouds had arrived by this point, but visibility was still OK. Floating Battery Island and 3 Sirens Island in the foreground. The Narrows in the distance. From the peanut, we began our return trip by looping southward towards the ridge for Black Mountain. At an elevation of 2000' we left the ridge to contour around the slope to reach the Black Mountain trail. Once back at the trail, we had an easy walk of about a mile and a half back to the car. Shortly after we reached the car it began to rain, but we had accomplished our mission! 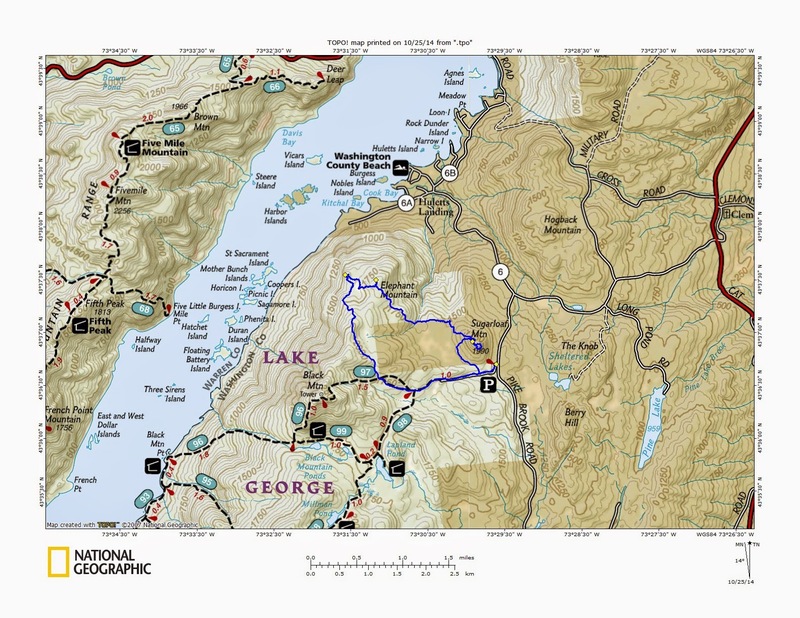 This older Nat Geo Map shows the land west of Sugarloaf to be private land. It is now State land! We bushwhacked off trail fr the Jeep road. 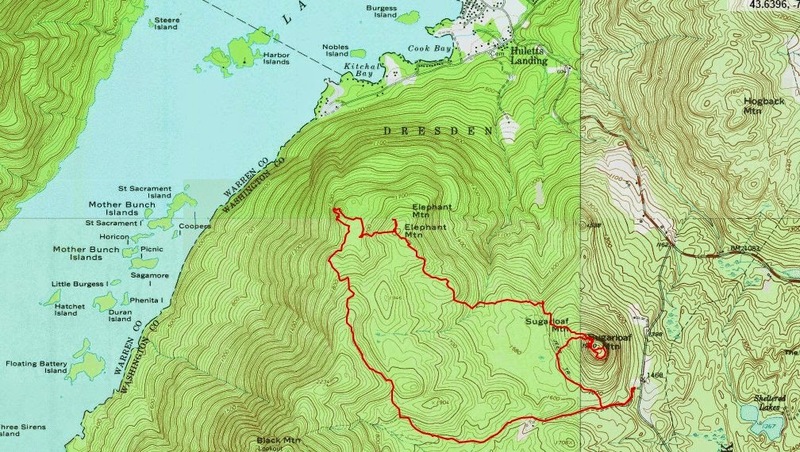 I use Caltopo.com to display my GPS tracks on topo maps and save screen shots of the maps for my blog.